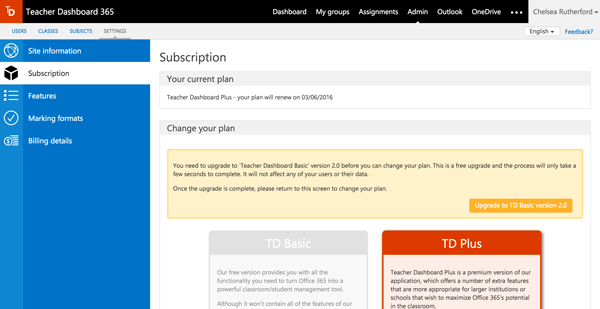 In order to take advantage of the great features in the latest release, you may need to upgrade your Teacher Dashboard plan to TD Basic 2.0. This is a really simple and quick process and is necessary to set the correct permissions with your teachers and students in order to continue setting assignments and sharing files. NOTE: You have to have Microsoft Tenant Administrator permissions in order to perform the upgrade. If this is not you, please speak to your IT team. When you are logged in as an Administrator on Teacher Dashboard, please click on the Admin link and go to the Subscription tab. Click on the button under Change your plan saying "Upgrade to TD Basic version 2.0"
Student Dashboard streamlines the assignment process for students, making it even easier to collaborate on and complete assignments. Your students' assignments, questions, feedback and grades are all tracked and in one place. By using Student Dashboard, there is no excuse for losing your homework or missing a deadline with our automatic file management system and countdown timers. We are really excited to be bringing you the latest new features and improvements to Teacher Dashboard, which makes it even easier for you to use Office 365 in the classroom.